Whoever thought of serving dessert in jars is a genius and I can’t believe I haven’t tried this before! These Passion Fruit Cheesecake Jars were so much fun to assemble that I can’t wait to do more versions. Plus I have a ton of homemade cream cheese lying in the fridge, waiting to be used. BONUS — Less than 10 ingredients were used, which makes these mini cheesecake jars waaaay more awesome. 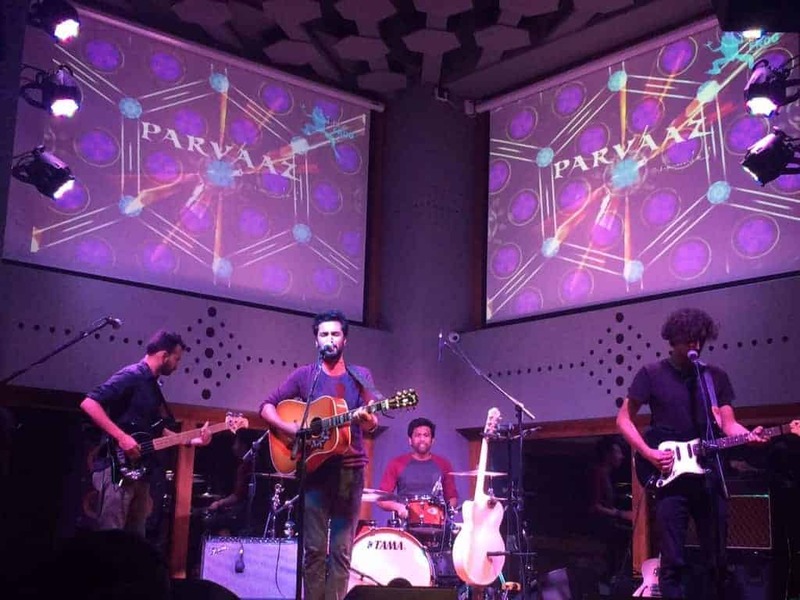 I’m writing this post slightly hungover and drowsy, because my amazing brother-in-law was playing for his fantastic band Parvaaz at Blue Frog last night and a bunch of us went to watch, had too many Cosmopolitans, followed by Jagerbombs, Tequila shots and some other alcohol that I can’t remember now. Point is, the party moved home after the gig, and luckily these Passion Fruit Cheesecake Jars were sitting in the fridge. They were shared between many drunk people who gave these the thumbs up. That might not be the best testimonial you’ve heard, but when you read how easy these are to make, I know you won’t be able to resist. Plus we are friends and I strongly urge you to try these out. Here’s another picture to convince you how delicious these beauties are. And creamy, and sweet and pretty. Obviously I made these with minimal effort and mainly 3 ingredients – Cream Cheese, Whipped Cream and Passionfruit which you’ll need to go buy. The rest you probably have in your pantry already. I’d love to see your version, so give me a holler on Instagram, post a picture and tag it #myfoodstories and I’ll repost my favorites. Plus it’ll be fun to be friends! 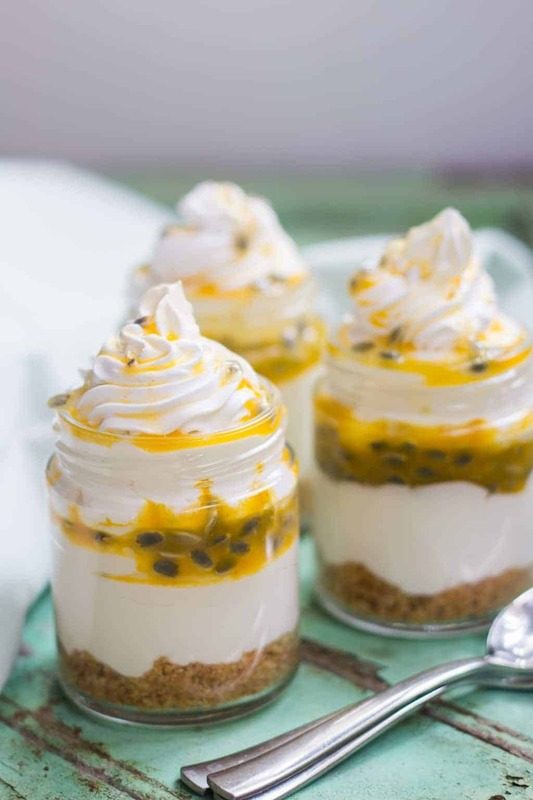 Extremely easy recipe for Passion Fruit flavored single serving cheesecake in a jar which uses only 8 ingredients, are portable and look beautiful at parties. In a bowl, whisk together cream cheese, 1/4 cup sugar, lemon zest and vanilla extract for 2-3 minutes. Add the heavy cream and whisk for 2 more minutes with a hand blender till the cream is properly combined. Pulse the granola a few times in a food processor till it resembles bread crumbs. Add butter and the remaining tablespoon of sugar to this and combine. To assemble, divide the granola mixture into 4 small jars. I used the back of a spoon to press the granola mixture evenly in the jars. Pipe the cream cheese mixture into the jars till about halfway full. Spoon two tablespoons of passion fruit pulp and spread it evenly. Fill the rest of the jar with cream cheese mixture. Top with whipped cream (optional) and more passion fruit pulp. Cool in the refrigerator for at least an hour before serving. I’ve used Homemade Cream Cheese for this recipe, but have seen great results with both D’lecta and Philly cream cheese as well. 2. I would be the happiest person ever if I came home after drinking and had one of these in my fridge to sober up with. looks yum. tell me how to make cream cheese. Do you think one can get passion fruit in Delhi? Thanks Richa. I tried the instant naan. I must say they looked pretty good. But it seems i took them off the fire too soon. Had to use the microwave to supplement cook time.